"Few humans ever witnessed the birth of a dragon, even less so one of those relics of dragons known as greater Grey ones. The key to my success was the very strong telescope of my own design I managed to put into my hideout several leagues from the beast's lair. Nevertheless I'm certain the beast knew of my presence, that it let me be can be of no other reason that it deemed me no threat. The Grey's egg was long as a grown man and elongated more so than your normal bird's egg. It was not camouflaged, nor particularly hidden. Sometimes the parent even left for long times, leaving the egg unguarded. After a few days of vigilance from my hideout, the reason for this carelessness became clear: not a single larger predator was alive nearby the lair. The forest was dead quiet far and wide. On my tenth day of vigil, the egg finally hatched. It is hard to describe my feelings at this tremendeous occation. My eye pressed against the lens, I made sure to take careful notes of everything. 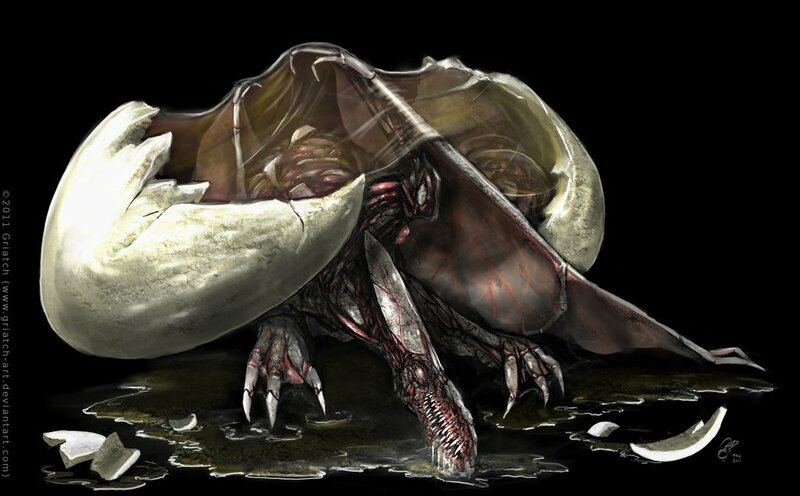 The Grey hatchling took some time to break out of the heavy shell, and got no help in this regard from its parent. The creature emerging lacked much of the soft features one expects in species' children, the child had claws and already the wicked "grin" of teeth were clearly prevalent. It seemed partly or fully blind at birth however, its eyes covered in white membranes rather than the pitch black glare of a grown creature. Contrary to more modern races of dragon, a greater Grey has no scales; it's not a reptilian but a separate sub-branch of the vertebrae. Studies have instead shown that its heavy armour is due to a gradual hardening and thickening of its skin, a sort of all-encompassing athlete's foot that continues throughout the dragon's life. This I could now confirm through my telescope: The new-born Grey already showed some patches of grey, but also large uneven patches of pink, unprotected skin, not yet hardened to its final structure. 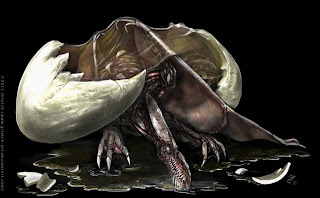 Its head seemed particularly unfinished; it crawled out of its sticky mess of birth fluids with much of the jaws not yet having acquired its armour. The new-born dragon flopped around helplessly for a few moments before pulling out its wing membranes and body from its egg, steadying itself and taking in its surroundings. Its eyes were blind, but I could have sworn it looked at me across the vast distance, with a wicked, shrewd intelligence unbefitting something so young ..."